Tonight we will cross the threshold into 2015. Here are a few ideas for closing the door on 2014, and feeling complete. Make a list of what you are celebrating. What insights did you have — however small? List any positive changes you made — however small. Small steps and incremental insights might seem too subtle to name. But even the tiniest tidbit of progress needs to be celebrated. By nurturing even the seemingly small seeds of beginnings, they begin to grow and flower and bear fruit. One small thing I am celebrating this year is that I took good care of my dog, Mr. French. I fed him, walked him, groomed him, and took care of his health needs. I did a good job in this area. (See, nothing is too small or inconsequential to be on this list). But even if you didn’t, there is always forgiveness. What are you going to forgive this year? What are you going to forgive yourself for? Forgiveness is a powerful thing — and an act of love. Are you willing to show up for yourself with an attitude of love and cut yourself some slack? I have put a lot of things on this list. I forgive myself for the times I was irritable and impatient. And for the times I tried so hard to control things when letting go would have served the situation better. What are you going to forgive life for? Can you consider forgiving life (the universe, God, fate, whomever or whatever) for giving you things you do not want? Can you consider cultivating some small attitude of forgiveness that things did not go the way you wanted them to? Note: This may be a very short list indeed! This can be deep, tough stuff. For me, the best I can do with this one is to say that I am willing to consider listing the things I would like to be able to forgive. List the things from 2014 that you did let go of…or things that you want to leave behind. For some of you, this might be something as big as a relationship that is ending. Or a job. Or a role you’ve always played, but are no longer wanting to play. Or it could be something concrete like clearing out the clutter in a room of your house. Or selling your car. Or even just taking down your Christmas tree and putting it on the street. Or…maybe there are some things you would like to let go of, but you are not ready yet. Take a deep breath, and write it on your list. Trust that you will know when it is time, and you will do it when you are ready. What concrete action can you take to close the door on 2014? This will symbolize your willingness to cross the threshold into the new year. It does not have to be a huge ceremonial ritual. Take a bath or shower — as if you are washing away 2014 and clearing the way for something new.Go for a walk. Unplug your devices for 10 minutes and sit quietly. Make up your own end-of-year ritual…it is less about taking a dramatic action and more about doing something simple with intention. And giving 2014 a good goodbye. Thanks to my teacher and mentor Bari Tessler Linden for providing the inspiration for this ritual. Working with Bari in her year-long money school called The Art of Money has inspired and changed my life for the better. Stay tuned for my next post on starting 2015 well. The Christmas season is upon us and before we know it, our minds become filled with all the many things left to do before the big day. With shopping, wrapping, socializing, cooking, and baking, our yoga practice can fall by the wayside. We begin to feel like there isn’t time or we’re too exhausted for even a little yoga practice. When we make time for practice, we discover we actually have more time. Our minds slow down and we focus on what is important. Our bodies become filled with energy and ease. We can rest in ourselves and connect to our world in a way that feels calm and alert. All that needs to be done, gets finished. We feel joyful and we are actually able to enjoy the season. Doing just a little yoga can ease feelings of anxiety about the holidays by bringing us home to our truest self. This is the place where we find comfort, happiness and peace. Now is the time for practice! Ardha Uttanasana: Half forward bend with hands on the wall. When you take time for yourself, you will have more time for others. Make this holiday a happy one. Treat your self this season, and join me for one (or more) of the holiday classes. Several EYC yogis & yoginis will hit the Memphis streets tomorrow to benefit of St. Jude Children’s Research Hospital. Here’s a little yoga sequence to help you recover when you’ve challenged your limits in the running/walking department. These poses help your whole system recover — and help your legs after you’ve exerted your energy. Poses where you relax while you elevate legs your legs can have a profound effect on your whole system. The top picture shows Rochelle practicing Upward Spread Foot pose (Urdhva Prasarita Padasana), and it is appropriate for nearly everyone. It can also be done with arms down at sides. For experienced students, practice the inverted pose Viparita Karani. 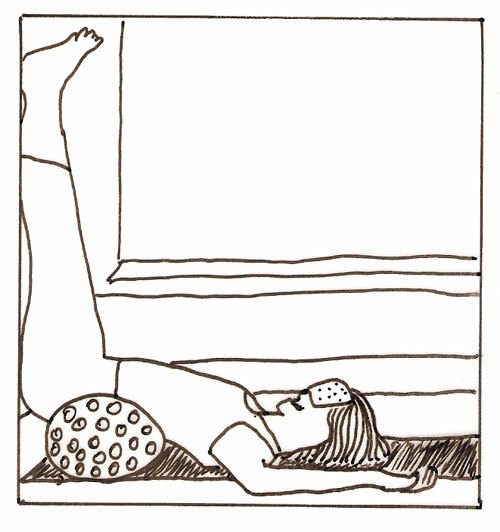 Finally, Virasana (Hero Pose @ left), can be done every day — but particularly after exertion. Virasana helps improve circulation to your lower legs and can restore flexibility and proper alignment to joints your feet, ankles and knees. This is the pose that Mr. Iyengar had the Indian Army do after their long training marches. Click on the pic for instructions on this pose. Mala Yoga Blog has spelled out a whole sequence for runners. You can benefit from (and learn special ways to practice) Virasana even if you have tightness in knees, ankles and feet.